Milarepa is the most well known practitioner of the yogic tradition in Tibet’s history, attaining the greatest potential of a human in a single lifetime. Though he lived over 1,000 years ago, his life example and the methods he employed on his path to awakening are still relevant to us today. In this weekend program, Christopher Stagg will discuss the relevance of Milarepa’s life through his narrative and songs. 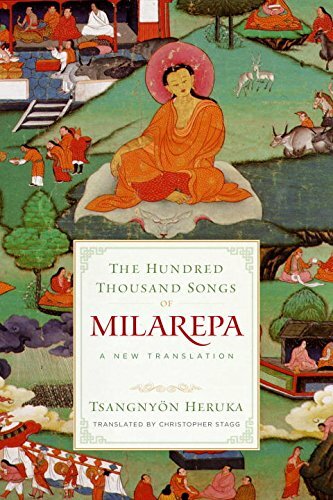 Chris will explore Milarepa’s encounters with male and female disciples as presented in his new translation of The Hundred Thousand Songs of Milarepa.There will be a book signing after the Friday night talk, so please bring your copy of The Hundred Thousand Songs of Milarepa if you have one. If not, a small number of books will be available for purchase.​Christopher Stagg is a Tibetan translator and interpreter for Nalandabodhi and the Nitartha Institute who has studied at Vajra Vidya Institute in Varanasi, India, and at Namo Buddha in Nepal. He recently translated The Hundred Thousand Songs of Milarepa (Shambhala, 2018) under the direction of Dzogchen Ponlop Rinpoche. He sings the songs of Milarepa and has degrees in voice performance and music education.